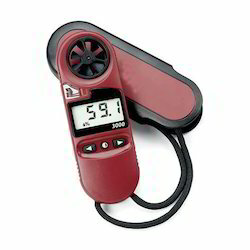 Prominent & Leading Wholesale Trader from Mumbai, we offer pocket weather meter. We provide a wide range of Weather Meter Pocket, which is a measuring instrument. These instruments are compact in sizes and predicts about the weather conditions such as humidity, speed and temperature levels of atmosphere. Our range of Weather Meter Pockets are useful for Hunters, Travellers, Mountaineers etc to know about the latest weather conditions. Looking for Weather Meter Pocket ?